Cell division, vital for growth and repair of the body’s tissues, may be a process one takes for granted. Any disruptions, however, could have serious consequences for the individual, thus necessitating a clear understanding of the process. Cells contain DNA, and a cell must compact this DNA in the form of X-shaped chromosomes as it prepares to divide into two individual cells. How the cell compacts—and then separates—its DNA is complex; disruptions can cause alterations in the DNA, potentially resulting in a host of disorders and diseases such as cancer and immunodeficiency, as well as aging and other effects. Understanding how a cell organizes itself to divide is essential in reducing the incidence of such diseases. Newly minted Canada Research Chair Dr. Damien D’Amours, a professor in the Department of Cellular and Molecular Medicine, is doing just that with a combination of leading-edge techniques in proteomics and cell imaging to explore the core mechanisms of genome organization during the cell cycle of normal and cancerous cells. Two papers by D’Amours, announced in May as a Canada Research Chair in Chromatin Dynamics and Genome Architecture and one of the Faculty’s latest Chairholders, and his teams have recently been published in high-impact journals, and feature complementary research on genome duplication. When a cell divides, an enzyme complex called condensin leads the charge for organizing duplicate packages of its DNA for each of two resulting cells. The work of D’Amours and colleagues in Molecular Cell reveals that condensin gets trapped in its own products as it compacts the DNA—begging the question of how it continues to perform its role. In the paper, the team goes on to identify the cellular components that work together to release the trapped condensin, allowing DNA compaction to resume. A second D’Amours-led study published last week in PLOS Biology shows how cellular energy is transformed into mechanical force that acts on DNA. Their results provide critical insight into how condensin harnesses energy for the process of packaging up duplicate DNA in preparation for cell division. The research explores how the cell goes about releasing the energy, and the impact this released energy has on the stability and structure of chromosomal DNA. “I expect our results will have a number of implications for the treatment of diseases,” say Dr. D’Amours of the studies. Main photo: A montage of individual stages in the DNA condensation process in Saccharomyces cerevisiae (baker’s yeast). Nuclear DNA is shown in red and the structure of chromosome XII is shown in green. Photo courtesy D’Amours lab. 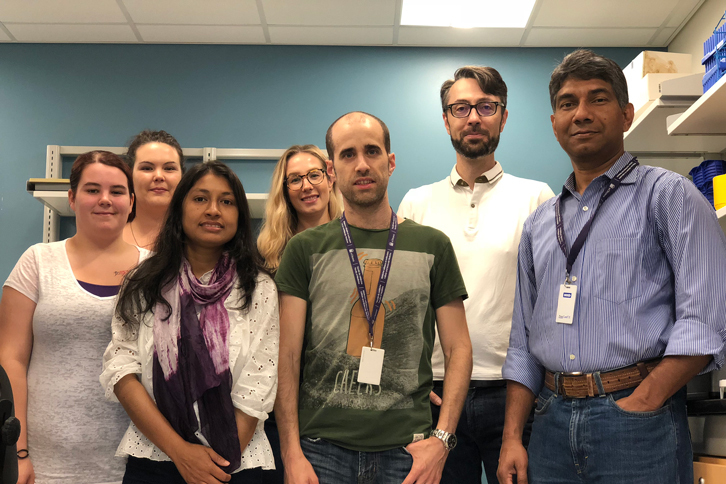 Members of the D’Amours lab (l-r): Jade Martin, Catherine Malo, Sahiba Rahman, Laurence Langlois-Lemay, Diego Serrano, Damien D’Amours, Muzaddid Sarker.